Raj Kumar Karan Vijay Singh is a multi-faceted personality who lives life to the fullest. The descendant of the Rashtrakuta solar dynasty from 8th Century AD and the great grandson of H.H. Maharaja Sardar Singh of Rao Jodha, he inherited his passion for sports with the same zeal. Since childhood, he has been an avid sportsperson with a keen interest in football, riding, shooting and golf. But he realized that his true calling was polo. He played a pivotal role in revitalizing the game in the blue city, Jodhpur. The ace polo player has made his mark in the international polo scene too. His career span in the game is more than a decade in which he won accolades at many Indian and International tournaments. His competitors were players from USA, Brazil, England, Germany, Belgium, Portugal, Kenya, Zambia, South Aafrica and Thailand. A veteran of the Jodhpur Eagles, he has been one of Jodhpur’s first players in recent times to own high- bred horses that have led to re-ignite the polo circuit. Even today he participates in Jaipur and Jodhpur polo circuits. Beside his passion for polo, he loves to travel along with his better half. His favorites are Africa and Europe where he gets a chance to challenge his passion for hunting. He says, “The best thing about the game is I get to travel and meet people while being recognized.” Numerous cups and trophies in the Bhaitak of Ranbanka palace echoes his triumphant victory. KV Singh is married to Kunwarani Shweta Rathore, from Jindaurah, UP. They met on the very same place where he played polo. Introduced through a common friend, he knew she was the one he would want to spend his life with. Born in a completely different background, Shweta saw herself in a different lifestyle after marriage. However, they shared the same exuberance of transforming the palace into a one-of- its kind luxury hotel. Both the prince Karan Vijay Singh and Kunwarini Shweta Rathore have an impeccable style of living. The duo is completely immersed in exploring further avenues for their business empire. Blessed with sons Bhanwar Janmejai Singh Rathore, 12 and Bhanwar Kartikeya Singh Rathore, 9, they make sure the cultural ethos and sanctum is maintained in the modern era. In spite of being a hotelier, he still remains a true polo player by heart. “To be in tandem with the polo circuit, we moved to Jaipur five years back. Our main aim also was to be near our children’s schools as we were not interested to send them away to a boarding school. For us, the main importance for our children is family bonding. This is possible only when they stay with the family and not away from them.” Says KV Singh. They boastfully talk about their kids to be independent thinkers. “While Janmejai has an ace shooter at the age of 12, his younger brother Kartikeya, 8 bonds with animals very well and loves riding.” Rajkumar Karan Vijay somehow loves spending time with his family. He is a doting father for his sons and encourages them to be keen sportsmen like him and thus continue the legacy. He never misses out on attending his elder son’s state and national tournaments of Golf, Cycle Polo, trap and double trap. On the other hand, younger son Kartikeya has all the support from his father KV Singh in building a farm for animals. Coined with conjugation of the literal meaning of master of battles, Ranabanka is true in every aspect. Built in 1927 for Maharaja Ajit Singh Ji, the palace has been preserved as a royal tribute to the by-gone era in the form of a luxury hotel. 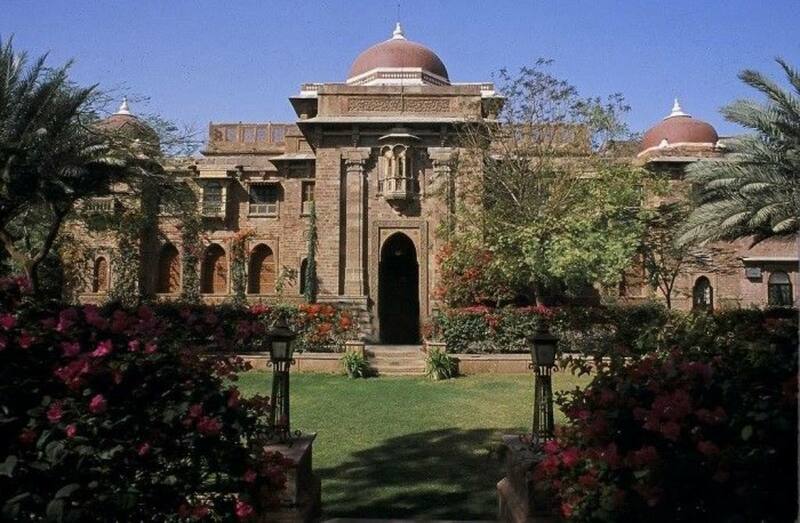 Till the year 2000, this exquisite palace was the abode of the Maharajadhiraj Sigh Ji of Jodhpur. Sharing the boundary wall of the Ajit Singh palace, it is also the property of Sobahgh Singh and his brother Swarup Singh. It then took shape of the luxury hotel after the Ranbanka Rathores. 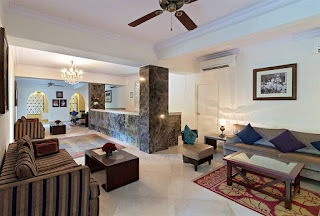 The majestic Palace has now been converted to an aesthetically designed, well-furnished luxury hotel that has lavish interiors and modern comforts. Built exclusively for Sir Ajit Singh, Maharajadhiraj of Jodhpur, it is continuing the legacy of heritage and style. “We hired staff from Oberois keeping in mind the fine taste that would remain on the palettes of the visitors after they left the hotel” says Kunwarini Shweta Rathore who is completely absorbed in making the hotel world-class. 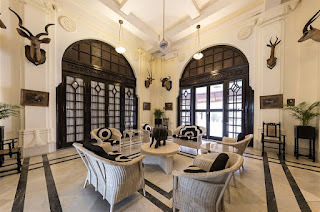 The Majestic hotel has elegant rooms, long corridors, grandiose terraces and gardens that have a unique story to tell. 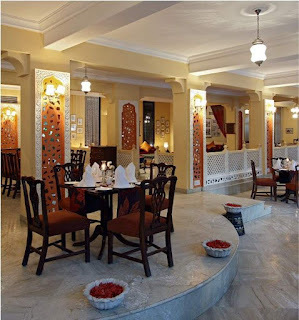 Recognized as one of Rajasthan’s foremost heritage experiences, Ranbanka Palace stands perfect with modern facilities ranging from Satellite TV and Wireless Fidelity to state-of-art Business Centre, Spa, multiple restaurants and dining experiences, Travel Desk, Shopping Arcade and everything modern. 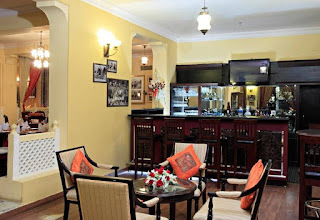 Though the luxury hotel had its share of problems in the initial stage, the prince was sure to maintain the decorum of the palace hotel with the best amenities giving his guests luxury and comfort. His commitment to preserve the by-gone era without comprising modern conveniences has definitely proved successful. The palace has every detail of the exuberance and warmth that resided at the palace. Going steady with 80 refurbished rooms, the palace also has a royal suite that was once the abode of the Maharaja himself. 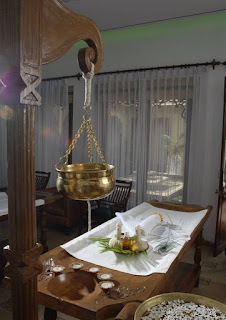 A rich feel of the royal legacy can be felt with silk drapes, rich linen, delicate artifacts, and silver cutlery. Not to leave behind is the warmth and attention extended by the attendants for the esteemed guests. A truly maharaja experience is what you get at Ranbanka Palace as soon as you enter the majestic abode. Once you step inside the luxury hotel, a cool drink and a chandan tilak awaits you. You are then ushered to the lobby that has an opulent appearance displaying the vibrant colors of Jodhpur. The aesthetically designed rooms celebrate the grandeur epitome of understated elegance. It has exclusive perks in the form of mini bar, tea-coffee maker, a king sized bathroom and a comfortable bed. You can refresh after that tiring journey with a warm bath and laze around for some time before you head towards the restaurant. The luxury Indoor air conditioned dining area has a capacity of 150 people that overlooks the center courtyard. It is inspired by the Five Royal Colors of the Jodhpur flag and looks beautiful with its vibrant colors. Indulge with succulent dishes in the traditional thali prepared by second generation chefs of the Royal family. Any tourist from any continent in the world is sure to have a hearty meal through the exhaustive items on the menu but if you are looking for something traditional, you can entice your taste buds with the Rajasthani Thali. 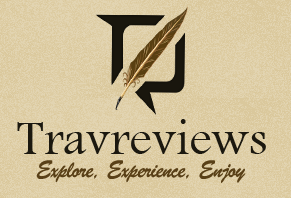 It has a plethora of delicious dishes that will satiate your hunger. The daal baati, a unique Rajasthani dish is something you should not miss while eating here. 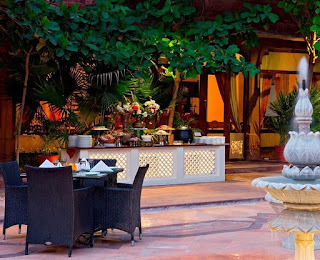 Enjoy the meal while your attendants serve you with the same style served to the Maharaja of Jodhpur. This bar has an added advantage. It not just serves you drinks of your choice, but the display of polo trophies takes you away to the by-gone era of family generations participated in major National and International tournaments. Sip your favorite cocktail while looking at the immaculate poses of the charming maharajas in their sporty avatar. 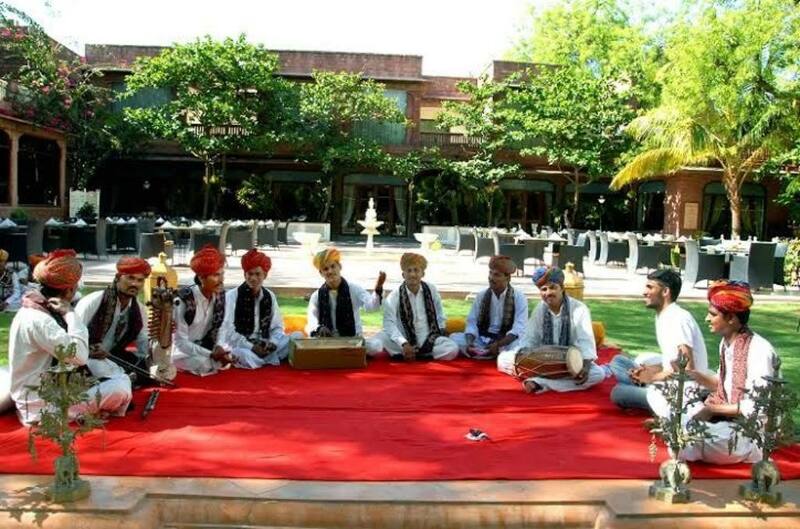 Get the feel of a true Rajput at the Ranbanka baithak. 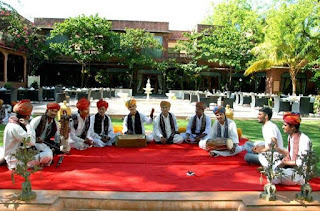 A lounge in a true Rajasthani set-up with Bajots & Gaddi Massons makes you actually feel like the Royal highness with the hotel staff pampering you in royal hospitality. The spa experience at ‘Spa By The Baradri’ is worth trying which includes signature spa therapies like Swedish massages or panchkarma from Ayurveda.The best masseurs give you the massage of your choice to soothe and relax your body with aromatic oils and pressure therapies. Dimly lit with soft soothing music, the pampering takes you away from all worries and tensions and gives you the relaxation you wanted. After a while, you can wash away the oil and head towards the pool to in tranquility amidst lush green lawns around you. The luxury hotel makes sure you are occupied with entertainment through the day. Langa dancers, puppet shows and traditional music recitals offer a chance to give you aspects of Rajasthani culture. You can even join the traditional folk singers and dancers who entertain you with the best songs of your choice or simply watch them while being served with kababs and mocktails on the lawns. Indulge in unique in-room shopping available at the Jodhana Wing; handcrafted and tailor-made RBJ mojaris, ethnic jewellery , silver artefacts and much more are all easily accessible without stepping out of the palace. Jodhpur is a beautiful city and the palace assures the guests also get a wonderful experience of the serene city. So after you have indulged in the ethnicity and luxury of the palace, the hotel cab will take you places with a guided tour. You can shop till you drop and take bags full without worrying about their load. The cab will drop you back to the hotel. Ranbanka is not just a hotel; it is much more. The conjugation of comfort and style is the hard work of Prince KV Singh and his family to give you the best preview of a Rajashtani comfort in a Maharaja style. The luxury palace is looking for expansion plans to reach out and give more to frequent traveller to the city of dreams, Jodhpur.